We all have things that we do to relax and unwind, read a good book, go a brisk walk, a glass of wine and a movie maybe. Well baking is my thing although I’m partial to the latter. I find it very gratifying whipping up a mouthwatering treat, filling the house with a sweet, warming aroma, lathering the icing on top and sitting down, all cosy on the sofa with a large steaming cup of tea and some freshly baked goodness. Carrot cake is one of those classics that I just love, packed full of warming spices and super easy to make. 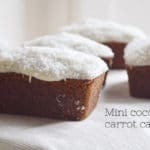 I decided to use coconut oil instead of the traditional vegetable or sunflower oil for these mini coconut and carrot cakes. I use coconut oil ALL the time, as a moisturiser, lip balm, hair mask and for cooking and baking. I just love it and it has a gorgeous smell. The taste of the oil is very subtile here but by sprinkling the desiccated coconut on top, it gives them a such a delicious coconut flavour along with all the beautiful spices. In this recipe I used a mini loaf tin x8 mini loaves measuring 5cm wide, 8cm long and 3cm deep but you can use a lined muffin tin or make it into a large cake if you don’t have one. 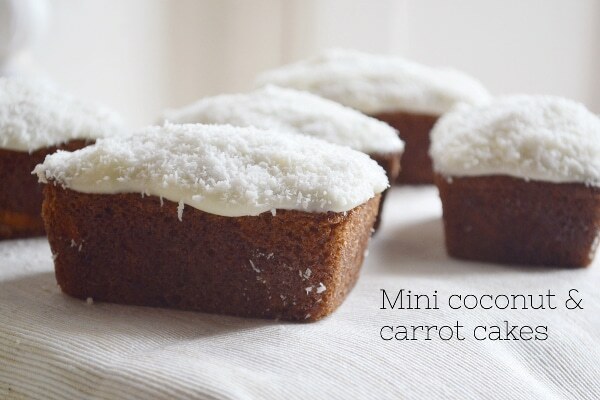 Light, fluffy mini cakes full of warming spices sprinkled with a coconut topping. Preheat the oven to 180 degreesC/350F/gas mark 4. Mix all the dry ingredients together in a large bowl. Add the wet ingredients to the dry ingredients and mix together. Spoon the mixture into the mini loaf tin and bake in the oven for around 15-20 minutes or until an inserted tooth pick comes out clean. Once baked, leave the cakes in the tray for 15 minutes then remove to a wire rack to cool completely. To make the icing put the cream cheese, butter, vanilla and icing sugar in a large mixing bowl and whisk together until combined. You want the mixture not as thick as buttercream but not too runny that it runs off the spoon like liquid. You can add more butter and icing sugar if you prefer a thicker mixture and of course any flavouring you want. 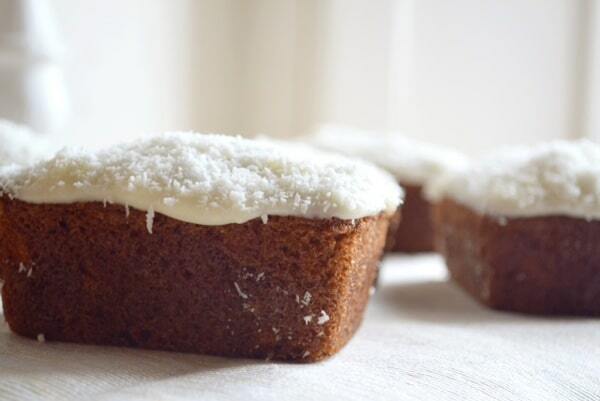 Spread the icing on the cakes and shower the coconut on top until completely covered. Enjoy with a large steaming cup of tea! Soft, light and so delicious, love this cake.